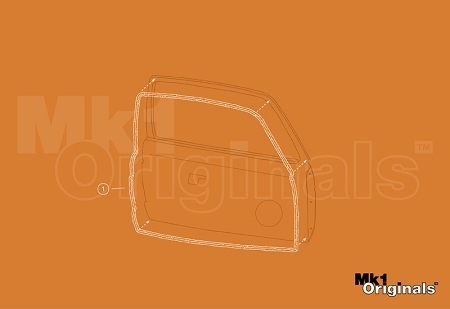 Mk1 Originals exact reproduction of the primary door seal 173 837 911H, this is the main foam rubber seal that runs around the entire perimeter of the door. Every aspect of the original has been carefully reproduced down to the grip ridges on the back side for proper adhesion and expansion holes every 10" to allow air inside the rubber to escape and have the door close properly. Made in a Dual Profile (2 separate seals then vulcanized in a mold together) exactly as original which is important as one profile needs the small extra lip to cover pinch metal on the lower side of the door. These are not generic universal seals as others sell so your ready for the highway or the concourse. Seal is also available as a primary door seal kit with the upper wind seal included at a discounted price. Fits: Front Doors on all 4 door Models Listed and Front Door on Pickup/ Mk1 Caddy. Rears also available in our store.